Polyurethane extra high abrasion resistance improves the life of parts normally made with rubber and steel. Moreover polyurethane dampens the noise normally emitted by steel components. Impact resistance of polyurethane is much higher, also at the low temperature, than the impact resistance of normal plastic materials. Polyurethane has a very high compression resistance, with many advantages for special applications. Polyurethane offers a very low friction coefficient which improves with the higher hardness. This feature justifies its use in large measure iin applications such as vibrating screens, brushes, belt wiping doctors, cement agitators, ecc. Up to 80°/90° for poly-ethers. 40°/50° for poly-esters. Not being subject to hydrolysis, the polyurethane has a good resistance to sea water. Polyuretanes a very high resistance to oils and solvents. The polyurethane provides a high elastic modulus, high-capacity transmission of forces and minimal permanent deformation even with high loads. The polyurethane can be vulcanised on many metals and also plastics for the realization of rollers, wheels or any other article also complex due to its ease of molding. With high hardness you can also work with machine tools as any other plastic material. Our company is able to provide a wide range of semi-finished products such as rods, sleeves, plates and blocks also of considerable thickness. Its exceptional features, the range of hardness available, ease of molding and its general versatility, allow this material to solve a wide range of problems in all industrial sectors. The polyurethanes, whose discovery dates back to 1937 thanks to the research of the German chemist prof. Otto Bayer, belong to the the plastics family. Are obtained by reaction between an isocyanate and a polyol, which produces a physical change of state from liquid to a solid and elastic material. Changing the raw materials and the combinations between them, with appropriate ratios, it is possible to obtain diversified properties that qualify for the different applications. Taking into account how many isocyanates and polyols are now available, additives, fillers, plasticizers, etc. possible formulations are virtually limitless and give a great variety of properties to polyurethanes. Some are primarily resistant to abrasion, resistant to acids as well as other some have good resistance to hydrolysis. There are polyurethanes with high resilience, in others, however, is practically nil. These elastomers are very resistant to hydrocarbons and oils (both vegetable and mineral). The indisputable resistance to compression of the polyurethane is, combined with its shape memory, a suggestion for countless applications. Research and experience allow you to have the optimal formulation for each application. The advantage of this product is characterized by the ability to lend itself to different types of machining operations and can be cut, sawn, glued, die-cut or worked to the lathe. A choice of many polyether and polyester, prepolymer and quasi, products in different colors and hardness ratings from 55 to 95shA – together with the use of latest-generation equipment such as the Baulé Sa model A4M (Advanced 4 Components Medium output) casting system capable of storing up to 200 different formulations in memory, enable us to offer a broad array of products for just about any imaginable application – from mining to paper making, and from mechanical and marine components to industrial sectors of all kinds. 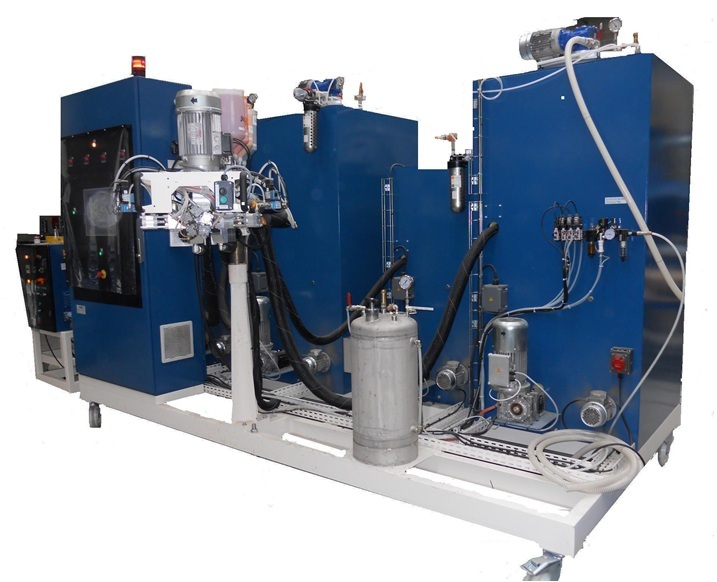 The two machines with automatic integrated reloading degasser, one for the production of polyether, one for a polyester, with an automatic control of the formulations based on NCO of each batch and stoichiometry request. This allows you to automatically have the necessary adjustments in formulations, based on the change of NCO each lot and always get products with perfect compounds. The colors are assigned according to the formulations, customized is based on the hardness that requires the client with the possibility to store up to 200 formulations, with log management based on batches of all the materials used.